When you make changes to dashboards that are displayed on several screens or on devices that don't have a keyboard permanently connected. This feature is only available for dashboards that have been shared through a share link. 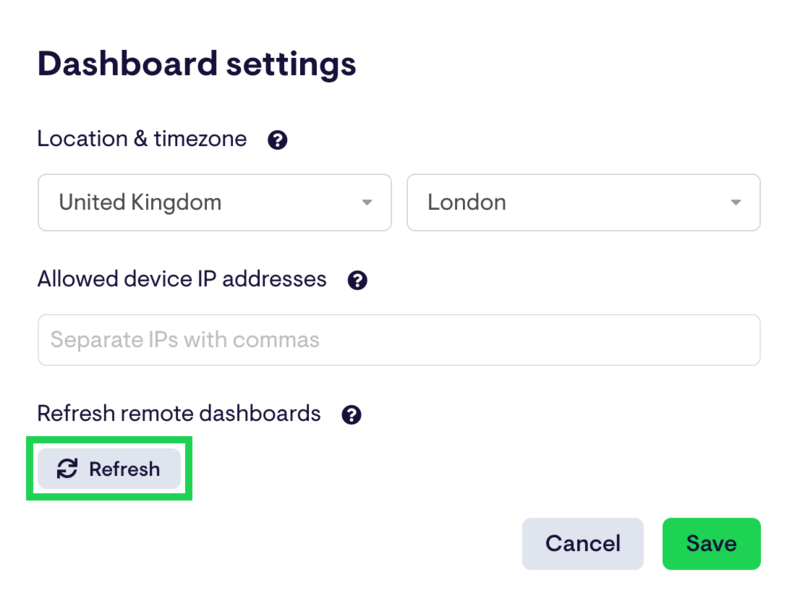 To quickly refresh your remote dashboards, follow these steps. Navigate to the Dashboard you wish to refresh. Select Dashboard settings from the drop-down menu. In the pop-up modal, press the Refresh under Refresh remote dashboards. If your plan supports it, you can refresh remote dashboards connected to a TV using Send to TV. To quickly refresh your dashboards on every connected screen displaying them, follow these steps. Click on Send to TV in the top right area of your screen. Click the more options menu next to the screen you want to refresh. Click Refresh from the drop-down menu.